We have the in-house know-how and past experience with the state of Connecticut to conceptualize, design and implement the e-Government Systems to enable the various state, local and Federal Government agencies to deliver all Government services to their constituents conveniently and efficiently. These services include a thorough understanding of the services provided by the agency/Government in question, the target market, development of a strategic plan and a functionality document, architecting the system, developing the websites, forms, incorporating the required functionalities on the website or forms and finally inter-connecting different offices, agencies via Internet as well as Intranet. These services also include providing informational and network security, session's security, multiple access levels and login and password authentication procedures. Businesses that move decisively towards e-Commerce functionality gain significant competitive advantages. These advantages require e-business tools capable of creating, maintaining, and delivering an e-Catalog. By leveraging our end-to-end e-Cataloging solutions, net market makers, manufacturers, and suppliers can search, view, and procure catalog items relying upon seamless connectivity and interoperability. Our solutions are tailored to meet the needs of businesses wishing to harness the power of e-Commerce to gain a global marketing platform for greater efficiency. The solutions offered by Cosmic reinforce a sustainable methodology for efficiency, accuracy, and quality of data. These comprehensive solutions create liquidity and increase critical mass in the e-Marketplace. Through its efforts, Cosmic aims to bring market makers, manufacturers, and suppliers closer together in the business ecosystem. B2B Vertical Portals (Vortals) as well as horizontal portals are one of our specializations. It brings the various buyers and sellers together in a virtual market place and result in huge savings in transaction and processing costs. We have successfully delivered such portals in the commodity trading, office supplies, shipping, flooring, recruiting, construction and real estate industries to our clients. Cosmic has delivered an online University solution to one of our clients. This solution enables this insurance industry based client to impart real time online tutorials/lectures to its customers (students) from his headquarters. The key components of this solution are Content Management, course profiles and availability at various different slots, secured transaction mechanism for purchasing the slots, videoconferencing, sales, accounting and inventory management. Cosmic developed this application for a marketing organization, which generates revenues both via credit-based (accrual based transactions) as well as point-of-purchase transactions. Cosmic's component-based development approach enables our clients to suitably deliver both the capabilities. 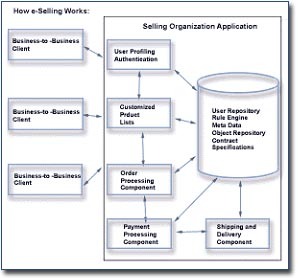 Individual components of this solution includes modules such as User Validation and Security, personalized Product-List display, Transaction Initiation, Capture, Order Management, Inventory Control, Delivery, Accounting Capture and Event Notification such as shipment and delivery notifications, and integrates with existing enterprise solutions for back-end compatibility and lower time-to-market with lower cost. The components are designed to integrate legacy application objects using distributed computing technologies like CORBA and Enterprise Java Beans. This provides a seamless development environment with ease of deployment effort without wasting precious resources in times of rapidly changing technologies. Messaging and document exchange component solutions for managing decoupled and disparate systems can be provisioned. Older and existing Enterprise systems can be communicated with through a standardized Data Exchange protocol that provides an open architecture to accept documents in different formats and standards. Integration with third-party secure payment and other channels can also be done. For a buying organization, this integrated solution offers great benefits of purchase control, monitoring and prevents maverick purchasing within the context of a large organization. The online nature of the application allows for easy purchasing with a few button clicks while adhering to aspects such as approvals and departmental budgetary control. 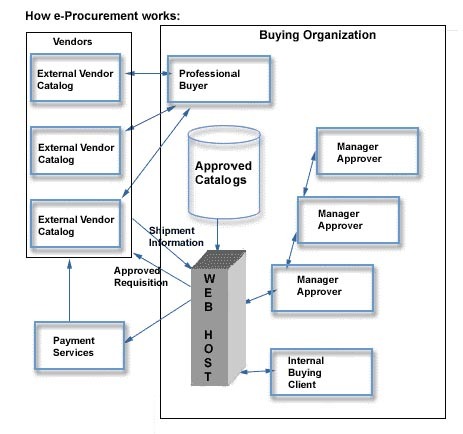 There are components facilitating web-enabled work flow to allow for management approvals over several layers for a given purchase requisition, notification on delivery, ability to split shipments based on geographical or cost-based parameters, and integration with third-party secure payment channels. Procurement solution allows the organization to consolidate widely distributed databases of users and data into one comprehensive repository that can be easily maintained and applied to several other applications including time card, reimbursements, vacation approvals and other personnel related aspects. Perform complete study of existing systems and business presence. A Feasibility analysis and Cost/Return Analysis. Effective management of customer relations is becoming a key source of competitive advantage as organizations redefine their strategies from product centric to customer centric. E-CRM application frameworks are organized around the customer and provide an integrated view of customer information between the array of internal business functions such as sales, marketing, customer service and support. Recent developments in Internet and E-Commerce has increased customer's expectation and raised the bar on expected service levels. At Cosmic, we recognize that we are in business because of our customers and so over a period of time we have gained vital expertise in designing and developing customized, effective and prudent web based solutions to manage and provide uniform view of information among all the activities to identify, attract, service and retain customers. Our solutions have provided both tangible (like enhanced ROI) as well as intangible benefits (like perennial customer loyalty) to our clients.